Averaging is how RRDTool (used by LPAR2RRD for data store and presentation) and other tools are working. You cannot show all short peaks if you do not have enough available pixels on the graph. Only the way how to display data is averaging data. 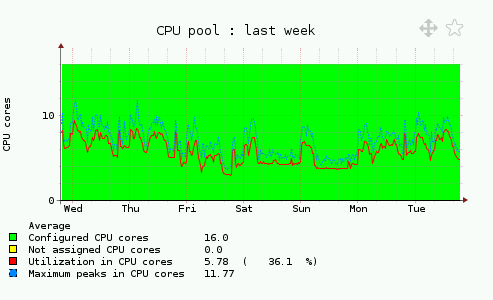 Version 4.90 has introduced MAX CPU pool graphs. It saves MAX for each interval and graph it together with usual averaged CPU utilization. On the example you can see dotted blue line which represents MAX achieved in given period. Why yearly graph shows less MAX value than the others? Yearly graph should always show the highes MAX. It is true however it might not have to happen in every case. You can see sometimes lower MAX value in yearly graphs than in the others. However when you use zoom in the yearly graph then it is ok, and you can see the highest MAX. It is all about data averaging which must happen even here. Yearly graph is based on 5 hours data (max in this case) but the picture itself has only 400 pixels width. Then RRDTool must average some 5 hours data to fit into that width what might cause small changes in peak high.